Maxim received his Bachelor and Master degrees from the Moscow Institute of Physics and Technology in 2010 and 2012, respectively. His Bachelor thesis addressed the problem of filling missing data values in the support vector machine classification framework. The Master thesis focused on the Gaussian processes regression and adaptive design of experiments. In 2012, Maxim started his postgraduate studies and switched the direction to the field of Mathematical Statistics. He concentrated on obtaining tight bounds for the Gaussian approximation of posterior distribution (Bernstein-von Mises phenomenon). The research resulted in a series of publications in peer-reviewed journals and formed the core of Maxim’s Candidate of Sciences thesis defended at the Institute for Information Transmission Problems in January 2016. 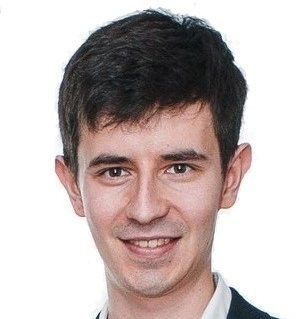 Starting in 2010, Maxim also worked part time as a research scientist in DATADVANCE Company, which is a resident of Skolkovo Innovation Center. There he participated in developing the library of data analysis methods for engineering applications. This library, pSeven, is now used by a number of companies worldwide, including Airbus, Porsche, Mitsubishi, Toyota, Limagrain and many others. Maxim is working on the development of algorithms for community detection in complex networks. The project covers the algorithms for detecting community by adaptive weights methods in Stochastic Block Models and detecting overlapping communities. Panov M., Burnaev E., Yarotsky D., Belyaev M., Kapushev E., Vetrov D., Prikhodko P. GTApprox: Surrogate modeling for industrial design // Advances in Engineering Software. 2016. Vol. 102. P. 29-39. Panov M. Nonasymptotic approach to Bayesian semiparametric inference // Doklady Mathematics. 2016. Vol. 93. No. 2. P. 155-158. Panov M., Burnaev E., Zaytsev A. Regression on the basis of nonstationary Gaussian processes with Bayesian regularization // Journal of Communications Technology and Electronics. 2016. Vol. 61. No. 6. P. 661-671. Burnaev E., Panov M. Adaptive Design of Experiments Based on Gaussian Processes, in: Lecture Notes in Computer Science Vol. 9047: Statistical Learning and Data Sciences: Third International Symposium, SLDS 2015, Egham, UK, April 20-23, 2015, Proceedings. Switzerland : Springer International Publishing, 2015. P. 116-125. Panov M., Spokoiny V. Finite Sample Bernstein – von Mises Theorem for Semiparametric Problems // Bayesian Analysis. 2015. Vol. 10. No. 3. P. 665-710. Panov M., Spokoiny V. Critical Dimension in Semiparametric Bernstein – von Mises Theorem // Proceedings of the Steklov Institute of Mathematics. 2014. Vol. 287. No. 1. P. 232-255. Panov M., Tatarchuk A., Mottl V., Windridge D. A Modified Neutral Point Method for Kernel-Based Fusion of Pattern-Recognition Modalities with Incomplete Data Sets, in: Lecture Notes in Computer Science Vol. 6713: Multiple Classifier Systems: 10th International Workshop, MCS 2011, Naples, Italy, June 15-17, 2011. Proceedings. Springer Berlin Heidelberg, 2011. P. 126-136.